These Championships were conducted without the World Cup overlay of the previous two years. The standard of the organisation did not drop and was superb. 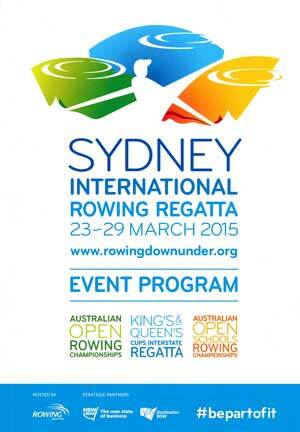 The regatta was generously supported by Destinations NSW, an agency of the NSW government. The regatta was a great success both on and off the water. The weather was kind for all but one session. Innovations included the ROWunion Marquee with bar and tapas menu to catch up with past rowing buddies and crews. Also new was the exhibition entitled ‘Rowing with the ANZACS – Remembering mateship and sacrifice’. The exhibition commemorated the Centenary of ANZAC in the context of Australia’s rowing heritage. On the 29 March, after the Schoolboys Eight race, there was a Commemorative Ceremony to pay tribute to South Australian rower, Tom Whyte, who died on 25 April 1915 at Gallipoli, Turkey, while rowing to shore. His Excellency General The Honourable David Hurley AC DSC (Ret’d), Governor of New South Wales and Mrs Hurley laid a wreath during the Commemorative Ceremony. Wreaths were also laid by Captain Charles Huxtable, Royal Australian Navy, President of the Australian Defence Rowing Association, and para-rowing World Champion and former Australian Army Sergeant, Gavin Bellis. This was one of the easiest wins for this point score trophy for some years. With Victoria winning four of the eight events, the result was never in doubt. The South Australians set the pace in the early stages of the race with Victoria in close pursuit. Both these crews were determined not to be left behind as in past years. By comparison, the start by the NSW crew was measured. The Victorians kept the pace well up in the second 500 metres to take the lead and did not let go thereafter. 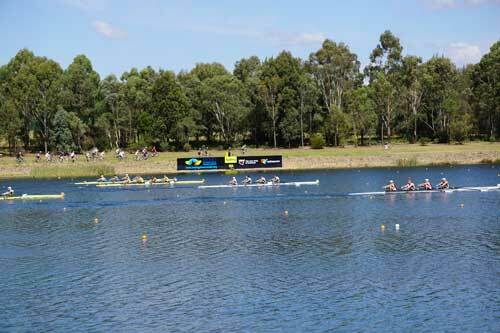 The South Australians maintained second place into the third 500 metres but faltered in this part of the race allowing the NSW crew through. The NSW crew maintained the pressure on the Victorians but the result was not in doubt. John Linke had the best of the start but the favourite Alexander Belonogoff soon imposed himself on the race. Linke remained in striking distance of Belonogoff for the first 1500m but could not break him. Another battle for the third place took place between McQueeney and Grant also over the first 1500m. McQueeney prevailed only over the final stages of the race. 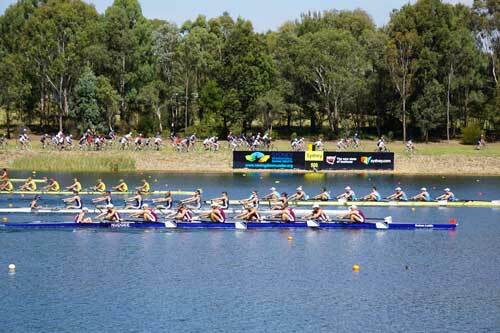 Queensland were hot favourites for this race and they led from start to finish. It was a great race for minor placings with Victoria in second place for the first 1500m. They were blown away by the fast finishing Western Australian and New South crews. The crews approaching the 500m with Queensland leading from Victoria, New South Wales, Western Australia and Tasmania. This was the strongest win in the 2015 Interstate Championships. New South Wales led from start to finish in a commanding performance. They increased their lead evenly throughout the race in a strong row. The Victorians led all the way but the race by the Queenslanders was superb. 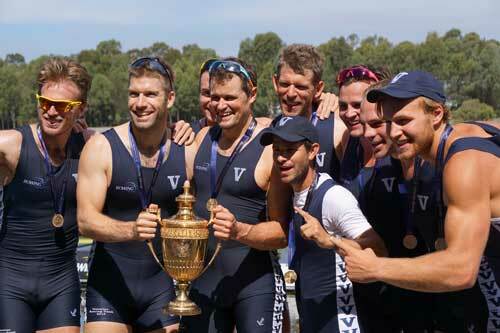 The Victorians raced a sensational second 500m which gave them the break which was race winning. The Queenslanders raced well to maintain the pressure of the Victorian throughout the rest of the race. The Tasmanian had a blistering first 1000m. 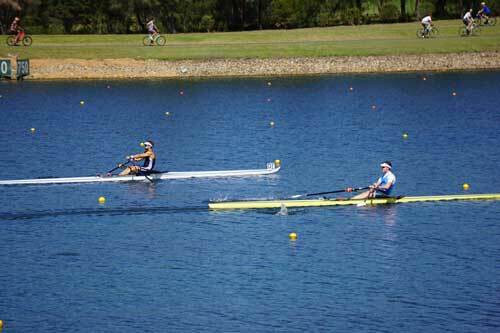 They gained a 1.5 second advantage in each of the first two 500 metres which was the winning margin. However the other big story in the race was the ship wreck in the leading New South Wales crew in the first 500m which lost them some 6 seconds. 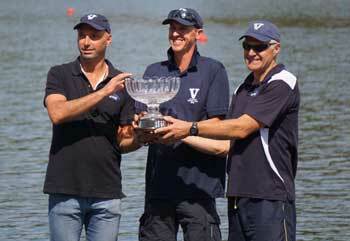 They rowed through the field to finish only 3.09 seconds behind Tasmania. The Victorians led from start to finish. The South Australian were the challengers to Victoria in the first half of the race but dropped off in the third 500 metres leaving the challenging to Queensland. 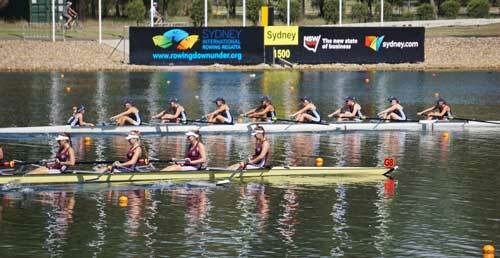 The Queenslanders had a slower start than the other crews but raced very well over the remainder of the race. 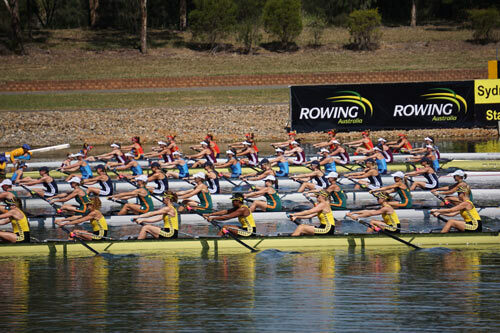 A good battle between the New South Wales and Western Australian crews for fourth and fifth places took place for much of the race. 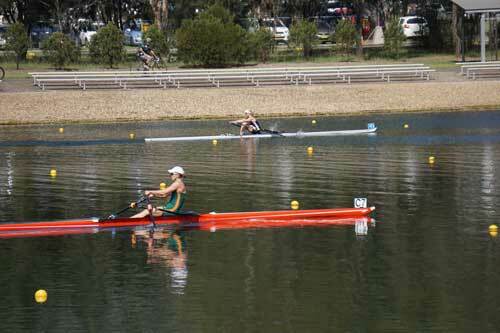 Australian single sculler Kim Crow was from start to finish as was expected. She also raced later in the Queen;s Cup, thus winning two gold medals in these Championships. The big story in this race was the superb race by veteran kerry hore to come in second place, only 3.68 seconds behind Kim.